"Australian coins featuring a Lion privy mark are popular in Germany, one of the Mint’s key overseas markets, where the animal is a prominent heraldic symbol associated with ancient ruling families from Bavaria," The Perth Mint said. 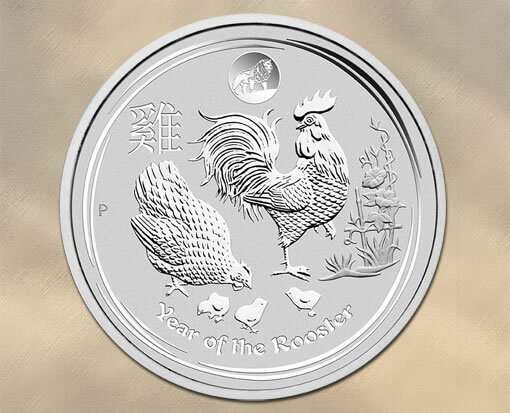 Limited to 30,000 and struck in 99.99% pure silver, the one-ounce bullion coin features a reverse (tails) design of a rooster, a hen, and three chicks standing among bamboo foliage and flowers. The lion privy mark appears above the rooster’s tail. Completing the design is the Chinese character for ‘rooster’, plus inscriptions of ‘Year of the Rooster and ‘P’ for the Mint’s traditional mintmark. The silver coin’s obverse (heads) depicts the Ian Rank-Broadley effigy of Her Majesty with inscriptions of ELIZABETH II, AUSTRALIA, 2017, 1 DOLLAR and 1OZ 9999 Ag. The Rooster coin with lion privy mark is sold on perthmintbullion.com. The coin is also available from the Mint’s authorized distributors Ainslie Bullion (ainsliebullion.com.au) in Australia and LPM (www.lpm.hk) in Asia. A standard bullion version of this coin, without the privy mark and limited to 300,000, is also sold by the Perth Mint and is available from bullion dealers around the world.